This text is an English summary of a research report titled Immigrations and Public Finances in Finland – Part I: Realized Fiscal Revenues and Expenditures, published by the think tank Suomen Perusta. The full Finnish-language version of the report is freely available on Suomen Perusta’s web page, and offers a much more extensive presentation of the results, including differentiation by age group, gender, and length of residence in Finland. “The most precise estimate of the realized costs [of the refugee crisis] so far has come from the researcher Samuli Salminen from the Finns Party’s think tank Suomen Perusta. […].”. Matti Sarvimäki, VATT Institute for Economic Research. ”Salminen (2015) presents a detailed comparison of the social benefits and the use of public services among immigrants living in Finland by country of birth.”. (p. 2). ”Salminen (2015) presents a detailed comparison of the social benefits and the use of public services among immigrants living in Finland by country of birth.”. ( p. 93). ”The studies used in the review did not contain information on the reason for immigration. However, a country of origin based analysis (Salminen 2015) makes it possible to deduce that the most negative public financial effects per capita are the result of humanitarian immigration and the most positive public financial effects come from the employment-based migration.”. (p. 60). V Samuli Salminen has been heard as an expert on immigration and public finances by the Employment and Equality Committee of the Parliament of Finland on 15.10.2015. Immigrations and Public Finances in Finland is a research project consisting of two parts. The first part, which is presented in summary in this document, focuses on realized, i.e. 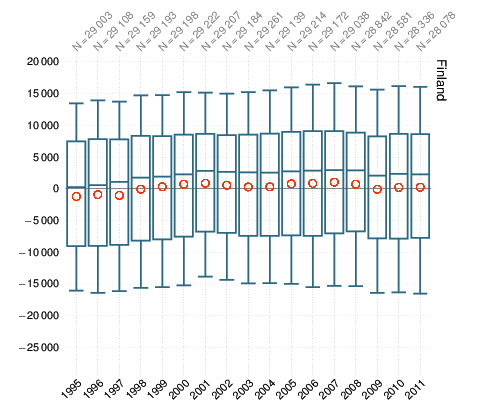 past, direct fiscal effects on public finances in Finland. In the second part of the research project, the focus of research lies in the life cycle effects of immigration, i.e. the direct effects on public finances over an individual’s whole life span. The research is based on Finnish and international academic research tradition in the field (see Bibliography at the end of this summary text). The most important difference between this and previous studies in the field is that in this study, immigrants are differentiated extensively. In other studies, there is either no distinction made between different immigrant groups, or if there is a distinction, it is made solely between immigrants of Western and non-Western origins. As the results of this research show, the lack of differentiation between various immigrant groups that is present in other studies cannot convey the large differences in direct fiscal effects that exist between different immigrant groups. 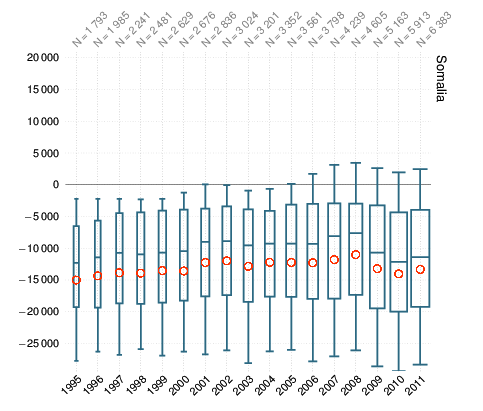 A second difference, in comparison to other studies in the field, is that the current research utilizes extensive panel data spanning the period 1995 to 2011. In this first part of the research project, the primary focus is on the direct fiscal effects to which working-age populations, i.e. immigrants 20 to 62 years old, have contributed. Definitions relevant to the research are presented in depth in the full research report. Briefly, an immigrant is defined to mean a person who has been born abroad, i.e. not in Finland. 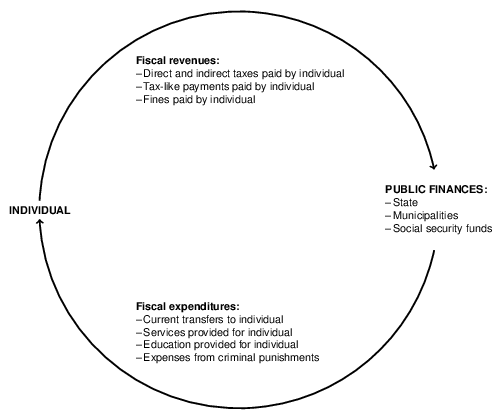 Public finances consist of the finances of the state, and those of municipalities and social security funds. Immigrants have been divided into groups according to their country of birth and their region of birth. In the first part of the research, fiscal revenues, expenditures and net effects are presented separately for persons born in Finland, for the ten largest foreign countries of birth (i.e. ten largest immigrant groups) and for eight different world regions of birth (see region map at the end of this summary text). The above-mentioned ten largest foreign countries of birth are made up of the ten largest immigrant groups according to their country of birth in Statistics Finland’s FLEED (Finnish Longitudinal Employer–Employee Data) register database in 2011. These countries are the former Soviet Union, Sweden, Estonia, the former Yugoslavia, Somalia, China, Iraq, Thailand, Turkey and Germany. The former Yugoslavia is defined to be the country of birth for all individuals who have been born in any of the states that belonged to the former Yugoslavia, or who were born in the former Yugoslavia during its existence. The proportion of the working-age population born in the former Yugoslavia whose native language is Albanian was 60 % in 2011. 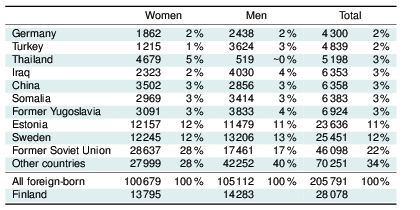 The total number of people included in the data for the year 2011 are presented below in Table 1. Table 1. Number of people of working age (20-62 years old) in the ten largest immigrant populations in Finland, and their proportions with respect to all foreign-born in 2011. Also shown is the sample size of Finnish-born people used in the study. Source: Statistics Finland (FLEED dataset). All foreign-born people of working age are also segmented into eight different regions of birth. These regions of birth are defined as: Eastern Europe and Caucasia, the Western world, the Greater Middle East, Southeastern Asia, Sub-Saharan Africa, East Asia, South Asia and Latin America and Other. Table 2 presents the number of foreign-born people of working age in 2011 by region of birth, and a map depicting the regions of birth can be found at the end of this summary text. Table 2. Number of people of working age (20-62 years old) from each region of birth, and their proportions with respect to all foreign-born in 2011. Also shown is the sample size of Finnish-born people used in the study. Source: Statistics Finland (FLEED dataset). The research measures the direct fiscal effects on the personal level. Fiscal effects deriving from companies and other non-person entities are not included in the research design. Direct fiscal effects consist of fiscal revenues and fiscal expenditures. Figure 1 below depicts the conceptual framework of the research. Fiscal expenditures may be either individually or collectively consumed by individuals. Individually consumed expenditures refer to those services which can be linked to an individual via information from person-level – more specifically person-period – register data. Examples of individually consumed fiscal expenditures include publicly-provided current transfers and social and health services. In the case of collectively consumed fiscal expenditures, it is virtually impossible to allocate the expenditure to particular individuals. Examples of these services include defense and public administration. The net fiscal effect is the difference between fiscal revenues and fiscal expenditures. Figure 1. The research design. Fiscal revenues and expenditures. 1. Current transfers received by individuals. 2. Direct and indirect taxes and tax-like payments paid by individuals. 3. Fiscal expenditures consumed individually, such as social and health services, education. 4. Fiscal expenditures consumed collectively, such as defense. Individually consumed fiscal expenditures (points 1-3 above) were studied using person-level databases maintained by Statistics Finland, the National Institute for Health and Welfare (THL) and the Finnish Immigration Service. Information on unit costs was collected from relevant Finnish studies, from central government budget proposals, or from Official Statistics of Finland (OSF). The research data is structured around the FLEED database maintained by Statistics Finland, which encompasses all foreign-born individuals between the ages of 15 and 70 who have resided in Finland during the period 1988-2011. Additionally, the data includes a simple random sample of 50,000 Finnish-born individuals between the ages of 15 to 70 who resided in Finland during the same time period. Due to a lack of data, it was not possible to allocate certain individually consumed public expenditures on an individual level; most importantly, these include a large share of the special services provided for immigrants by Finnish municipalities. Some of the key results of the research are presented below. The results are presented more extensively and more specifically, e.g. by age group, gender, and length of residence, in the full-text, Finnish-language version. The results presented below show average net current transfers and average net fiscal effects by country of birth and by region of birth in the year 2011. 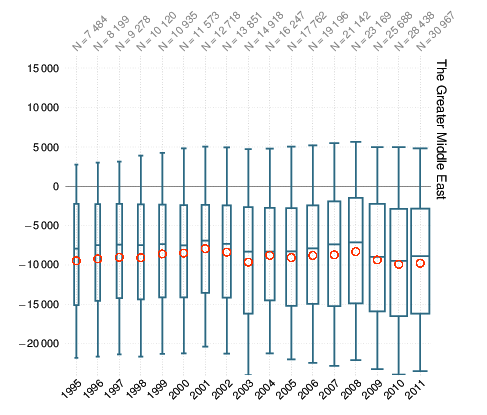 Furthermore, summary statistics for net fiscal effect distributions are presented as time series for the years 1995-2011 for those two countries of birth and those two regions of birth that had the most positive and the most negative average net fiscal effect among the working-age population in 2011. Net current transfers are made up of differences between taxes and tax-like payments paid to the government and current transfers that are received by an individual. Based on data presented in the full report, it can be concluded that the differences and ranks observed between countries and regions of birth in net current transfers are consistent with the differences and ranks observed when the data is expanded to consider net fiscal effects. Net fiscal effects are derived from net current transfers by adding indirect taxes and fines paid (such as criminal fines) to the revenue side, and expenditures from received social and health services (including education, the justice system, active labour market policies, and a portion of the reception and integration costs of asylum seekers and quota refugees) as well as from collectively consumed public services on the expenditure side. A more thorough explanation of the research methods and the derivation of results from the research data is presented in the full research report. Figure 2. Net current transfers without indirect taxes by country of birth in 2011. Averages for populations aged 20-62 years old. For Finland’s average, a 95% confidence interval is presented. Source: Statistics Finland (Total statistics on income distribution, health insurance transfers and other transfers provided by The Social Insurance Institution of Finland, FLEED database). Average net current transfers for working-age populations by country of birth in 2011 are presented in Figure 2. The average net current transfer for the working-age population born in Finland was approximately +3,400 euros in 2011. For all foreign-born, the average was close to zero, approximately +200 euros. Among the ten largest immigrant groups defined by country of birth, average net current transfers ranged from –7,900 euros for those born in Somalia to +5,100 euros for those born in Germany. In addition to the average for those born in Germany, the averages for those born in Estonia, China and Sweden were also above zero in 2011. In addition to the average for those born in Somalia, the averages for those born in Iraq, the former Yugoslavia, Thailand, Turkey, and the former Soviet Union were also below zero in 2011. Figure 3. 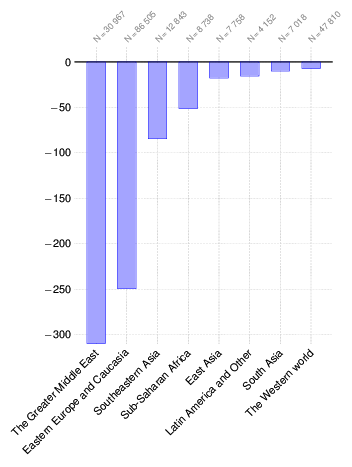 Net fiscal effects by country of birth in 2011. Averages for populations aged 20-62 years old. For Finland’s average, a 95% confidence interval is presented. Sources: Statistics Finland (registers), OSF (statistics), THL (registers and studies), the Finnish Immigration Service (Register of Aliens and statistics), central government budget proposals (2002-2013), The National Research Institute of Legal Policy (Optula, 2007-2013), Jäntti (2009) and the author’s own calculations based on these sources. Average net fiscal effects for working-age populations by country of birth in 2011 are presented in Figure 3. Average net fiscal effects ranged from –13,850 euros for those born in Somalia to +2,240 euros for those born in Germany. The average net fiscal effect for the working-age population born in Finland was approximately +80 euros in 2011 (95% confidence interval, [–173, +339]). For all foreign-born the average was approximately –3,620 euros. Figure 4. 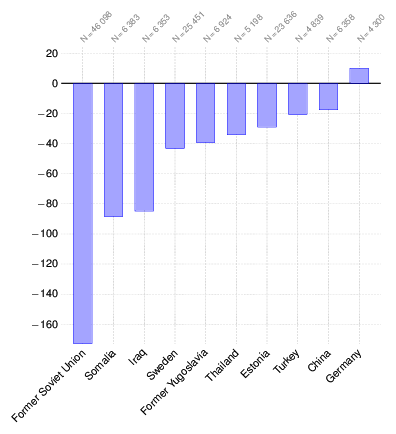 Net fiscal effects by country of birth in 2011. Totals for populations aged 20-62 years old, in millions of euros. Sources: Statistics Finland (registers), OSF (statistics), THL (registers and studies), the Finnish Immigration Service (Register of Aliens and statistics), central government budget proposals (2002-2013), The National Research Institute of Legal Policy (Optula, 2007-2013), Jäntti (2009) and author’s own calculations based on these sources. The total net fiscal effects for working-age populations by country of birth in 2011 are presented in Figure 4. The totals are calculated as the product of the population’s average net fiscal effect and the number of observations, so they are affected by both multiplicands. 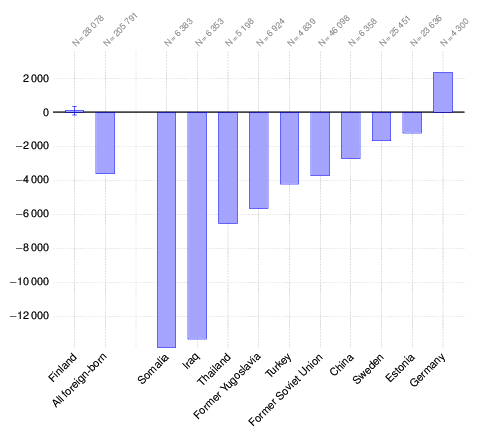 Among the ten largest immigrant groups defined by country of birth, the total net fiscal effect was the most negative for those born in the former Soviet Union, approximately –173 million euros in 2011. The total net fiscal effect for those born in Somalia was approximately –88 million euros, and for those born in Iraq, approximately –85 million euros in 2011. The total net fiscal effect of the working-age population was the most positive for those born in Germany, approximately +10 million euros in 2011. Figure 5. Net current transfers without indirect taxes by region of birth in 2011. Averages for populations aged 20-62 years old. For Finland’s average, a 95% confidence interval is presented. Source: Statistics Finland (Total statistics on income distribution, health insurance transfers and other transfers provided by The Social Insurance Institution of Finland, FLEED database). 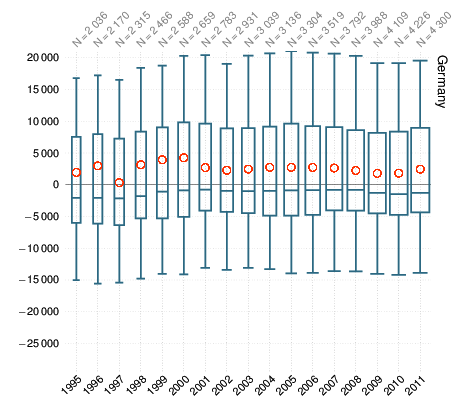 Average net current transfers for working-age populations by region of birth in 2011 are presented in Figure 5. The average net current transfer for the working-age population born in Finland was approximately +3,400 euros in 2011. For all foreign-born the average was close to zero, approximately +200 euros. 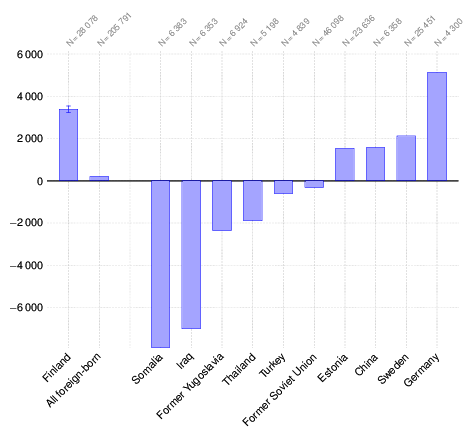 The average net current transfer in 2011 for those born in the Western world was close to that of those born in Finland, approximately +3,300 euros. The averages for those born in the regions Eastern Europe and Caucasia, and Latin America and Other were positive but below +500 euros in 2011. 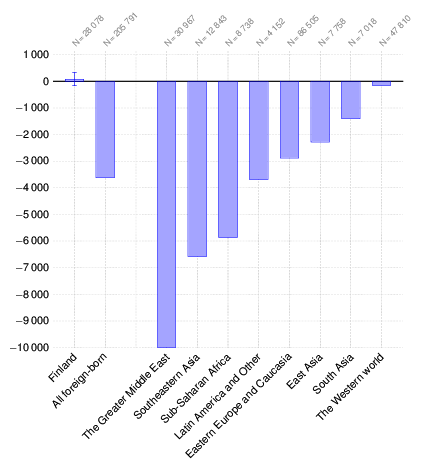 The largest negative average net current transfer was among those who were born in the Greater Middle East, approximately –4,500 euros. Figure 6. Net fiscal effects by region of birth in 2011. Averages for populations aged 20-62 years old. For Finland’s average, a 95% confidence interval is presented. Sources: Statistics Finland (registers), OSF (statistics), THL (registers and studies), the Finnish Immigration Service (Register of Aliens and statistics), central government budget proposals (2002-2013), The National Research Institute of Legal Policy (Optula, 2007-2013), Jäntti (2009) and the author’s own calculations based on these sources. Average net fiscal effects for working-age populations by region of birth in 2011 are presented in Figure 6. Average net fiscal effects ranged from approximately –10,000 euros for those born in the Greater Middle East, to –150 euros for those born in the Western world. The average net fiscal effect for the working-age population born in Finland was approximately +80 euros in 2011 (95% confidence interval, [–173, +339]). For all foreign-born the average was approximately –3,620 euros. The average for those born in the region Latin America and Other was close to the average for all foreign-born, approximately –3,670 euros. 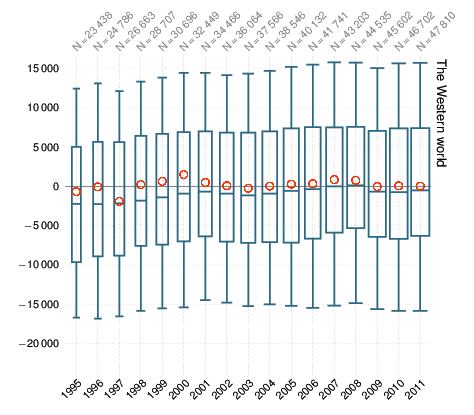 In addition to those born in the Western world, working-age populations born in Eastern Europe and Caucasia, East Asia, and South Asia had averages that were above the average for all foreign-born in 2011. Figure 7. Net fiscal effects by region of birth in 2011. Totals for populations 20-62 years old, in millions of euros. Sources: Statistics Finland (registers), OSF (statistics), THL (registers and studies), the Finnish Immigration Service (Register of Aliens and statistics), central government budget proposals (2002-2013), The National Research Institute of Legal Policy (Optula, 2007-2013), Jäntti (2009) and the author’s own calculations based on these sources. Total net fiscal effects for working-age populations by region of birth in 2011 are presented in Figure 7. The totals are calculated as the product of the average net fiscal effect for a population and the number of observations, so they are affected by both multiplicands. 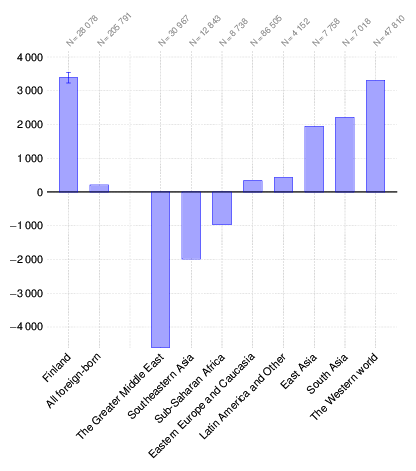 Among the immigrant groups defined by region of birth, the total net fiscal effect was the most negative for those born in the Greater Middle East, approximately –310 million euros in 2011. The total net fiscal effect for those born in Eastern Europe and Caucasia was approximately –250 million euros. The foreign-born working-age population with the least negative total net fiscal effect was those born in the Western world, at approximately –7 million euros in 2011. The distribution of net fiscal effects as time series are presented below. Results are presented for those born in Finland, for all foreign-born, for those born in Germany, for those born in Somalia, for those born in the Western world, and for those born in the Greater Middle East. The results presented represent the countries and regions of birth with the most positive (Germany, the Western world) or most negative (Somalia, the Greater Middle East) average net fiscal effects among foreign-born working-age populations in the year 2011. In the full research report, time series figures are presented for all of the ten largest countries of birth, as well as for all the regions of birth. In Figure 8 below, the summary statistics of time series, which are presented in box plot diagrams, are explained. Figure 8. 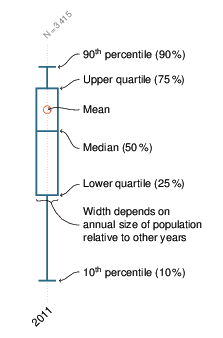 Definitions of the summary statistics in Figure 9. Figure 9. Net fiscal effects by country and region of birth in 1995-2011. Summary statistics in euros for populations aged 20-62 years old. Sources: Statistics Finland (registers), OSF (statistics), THL (registers and studies), the Finnish Immigration Service (Register of Aliens and statistics), central government budget proposals (2002-2013), The National Research Institute of Legal Policy (Optula, 2007-2013), Jäntti (2009) and the author’s own calculations based on these sources. Figure 10. Division of countries of birth into regions of birth. Bodvarsson, Örn B. and Van den Berg, Hendrik (2013): The Economics of Immigration. Springer, New York. Borjas, George J. (1994): The Economics of Immigration. Journal of Economic Literature 32(4): 1667–1717. Bratsberg, Bernt; Raaum, Oddbjørn and Røed, Knut (2010): When Minority Labor Migrants Meet the Welfare State. Journal of Labor Economics 28(3): 633–676. Collier, Paul (2013): Exodus: How Migration is Changing our World. Oxford University Press. Dustmann, Christian and Frattini, Tommaso (2013): The Fiscal Effects of Immigration to the UK. Centre for Research and Analysis of Migration. Discussion Paper Series No 22/13. Ekberg, Jan (1999): Immigration and the public sector: Income effects for the native population in Sweden. Journal of Population Economics 12: 411–430. Ekberg, Jan (2006): Immigration to the Welfare State. Is it a Burden or a Contribution? The Case of Sweden. AMID Working Paper Series 48/2006. Ekberg, Jan (2011): Will Immigration to Sweden Make it Easier to Finance the Welfare System? European Journal of Population 27:103–124. Gerdes, Christer; Schultz-Nielsen, Marie Louise and Wadensjö, Eskil (2011): The Significance of Immigrations for public finances in Denmark. University Press of Southern Denmark and The Rockwool Foundation Research Unit. Hinte, Holger and Zimmermann, Klaus F. (2014): Does the Calculation Hold? The Fiscal Balance of Migration to Denmark and Germany. IZA Policy Paper No. 87. Holmøy, Erling ja Strøm, Birger (2012): Makroøkonomi og offentlige finanser i ulike scenarioer for innvandring. Statistics Norway. Kerr, Sari Pekkala and Kerr,William R. (2011): Economic Impacts of Immigration: A Survey. National Bureau of Economic Research (NBER). Cambridge, Massachusetts. OECD (2013): The fiscal impact of immigration in OECD countries. International Migration Outlook 2013. Chapter 3: 125–189. Hämäläinen, Kari; Kangasharju, Aki; Pekkala, Sari and Sarvimäki, Matti (2005): 1990-luvun maahanmuuttajien työllisyys, tuloverot ja tulonsiirrot. Työpoliittinen tutkimus 265. Ministry of Labour. 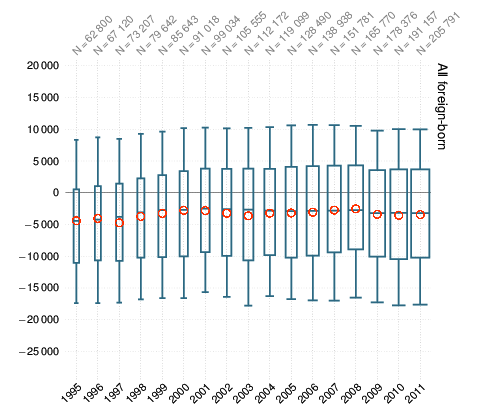 Jäntti, Markus (2009): Tulonjaon ja verojen kohtaannon kehityksestä Suomessa 1985–2006. Åbo Akademi University. Preston, Ian (2013): The Effect of Immigration on Public Finances. Centre for Research and Analysis of Migration. Discussion Paper Series No 23/13. Rowthorn, Robert (2008): The fiscal impact of immigration on the advanced economies. Oxford Review of Economic Policy 24: 560–580. Sarvimäki, Matti (2010): Maahanmuuton taloustiede: lyhyt johdatus. Kansantaloudellinen aikakauskirja 106(3): 253–270. Sarvimäki, Matti (2011): Assimilation to a Welfare State: Labor Market Performance and Use of Social Benefits by Immigrants to Finland. Scandinavian Journal of Economics 113(3): 665–688. Sarvimäki, Matti and Hämäläinen, Kari (2010): Assimilating Immigrants: The Impact of an Integration Program. Centre for Research and Analysis of Migration (CReAM) Discussion Paper No 19/10. Storesletten, Kjetil (2000): Sustaining Fiscal Policy through Immigration. Journal of Political Economy 108(2): 300–323. Storesletten, Kjetil (2003): Fiscal Implications of Immigrations – A Net Present Value Calculation. Scandinavian Journal of Economics 105(3): 487–506. VATT (2014): Maahanmuuttajien integroituminen Suomeen. VATT-analyysi 1-2014. VATT Institute for Economic Research. VATT (2014b): Maahanmuuttajien integroituminen Suomeen. Liite VATT-analyysin lukuun 5. VATT-analyysi 1-2014. VATT Institute for Economic Research. Wadensjö, Eskil and Orrje, Helena (2002): Immigration and the public sector in Denmark. Aarhus University Press and The Rockwool Foundation Research Unit.